Ever been in a lose-lose situation? They make you feel trapped. No answer seems good. Mutually Assured Destruction. You shoot an arsenal of nuclear bombs at me, and I will shoot my arsenal of nuclear bombs at you. Boom. Not a good solution. What about other lose-lose situations that are more a part of our daily lives? Or it is like the true story I heard of a man who had amassed nearly a million dollars for retirement. When retirement came he decided to invest some money in stocks. It was when tech stocks were booming and he sunk $100,000 into what seemed a sure bet. The tech bubble burst and the price of the stock dropped precipitously. He was sure it would rebound. It did not. Instead it hit new lows. So he sold the stock for a quarter of his purchase price. When the stock dropped again, he decided to invest again, thinking the rebound was coming. It didn’t. Another $100,000 mostly lost. But when the stock kept dropping he kept thinking it had finally hit rock bottom, and he would invest with dreams of getting his investment back. The stock astounded him by dropping every time. All told he lost $700,000. There are other ways to describe this: A no win situation. A dilemma. A pickle. Have you ever had to get out of a no-win situation? Did you have to take a loss? In our ongoing study of the Life of Jesus through the Gospel of Luke, we have come to his final week. Last week while we fast-forwarded to the resurrection for Easter Sunday, we also rewound to a parable he told of a great banquet. At that time he was having dinner with a Pharisee and he boldly predicted their demise before God. The Pharisees didn’t like him for that. Now back to his final week, and things are coming to a head. The religious elite, including the Pharisees, are desperate to take him down. For Jesus it seems like a lose-lose situation. Check out Luke 20:1-18 and join us at Faith Church on Sunday April 3 to see if Jesus gets out of a lose-lose situation. It is hard to be satisfied deep within. Psychologists call this the empty self. There is within most of us a dissatisfaction. We seek to fill that with consumer goods or with food, hobbies, vacations or thrills. Sometimes we seek to fill that inner longing with addictive behaviors. We can also seek fulfillment by accomplishing great tasks, with making money, or with watching a TV show. How do you seek fulfillment in your life? No doubt all of those things do fill the empty self for a time. But only for a time. What we notice is that the dissatisfaction comes back. Over and over it comes back. And we seek to fill it over and over. My wife, Michelle, and I got new smart phones last year. Within a couple months the newer model of the phone came out, and all of a sudden my new phone felt old…obsolete. I felt within my heart a desire to get the new one. I felt upset that I didn’t know the newer one was coming out so soon. I started to think that maybe I needed to go to the store and ask for a refund, thinking that they should have told me. I would have waited to get the newer one. But I decided not to go through all that trouble. Now almost a year later, guess what? Another newer model has just been released! Now my phone is two versions old. And those feelings of dissatisfaction have started rising up inside me again. There is an answer to this ongoing sense of empty self. The banquet of the Lord. How can a banquet answer our deepest longings of our soul? Let’s talk about that. Jesus told the Parable of the Banquet while he was at a Pharisee’s house for dinner. In the parable he says that the first set of guests were too busy to come to the banquet. They said no. So the master sends his servant to invite a second, then a third, set of guests, so that he can fill up his banquet hall with rejoicing. In the parable Jesus is teaching that some people reject God’s invitation, and for a variety of reasons. But God wants all and invites all to his banquet. What we learn about God’s invitation will help us answer how God’s banquet can fulfill our deepest longings. On Easter we remember the resurrection. It is the clearest invitation from God that there is! Let me explain. When you look at the invitation God has given you to enter into his banquet, there is only one way to accept the invitation, by faith. One of Jesus’ earliest followers, Paul, had something to say about the invitation to the banquet, especially because he was one of the ones that was against Jesus. Paul was the kind of guy who would be going around trying to keep people away from the banquet. Paul actually was one of those Pharisees. And in the first couple years after Jesus returned to heaven, and Jesus’ followers were inviting more and more people to God’s Kingdom banquet, Paul stepped in and said “STOP!” In fact he started rounding them up, sending them to jail, even trying to kill some. Until Jesus spoke to Paul in a miraculous voice saying “Paul why are hurting me? I have an invitation for you. I want you in my banquet. I also want you to be the servant who goes out all around the world inviting people to my banquet. My house is nowhere near full.” From that point on Paul spent his life traveling the Roman Empire inviting people to God’s banquet. You see what this means? God’s invites you to his banquet today. It’s not a banquet of food. Instead it is an invitation to receive him, to follow him, and allow him to transform your life with his power. Do you feel the emptiness in you? The empty self? Accept God’s invitation and allow his resurrection power to flow into your life. It’s a banquet to a new life. Not to a perfect life, not necessarily to a life of earthly blessings, not to a life where it is promised that life will be easy or that life will be as we think it should be. But when we feast at God’s Banquet table, it is a life loved by God, a life of community with other followers of Christ where we love and care for one another. Through God’s Banquet, in other words, he meets our deepest longings. When we accept God’s invitation, we are inviting him to transform our lives. At God’s banquet table we find the only place that our empty selves find fulfillment. I’d love to talk with you further about how to RSVP to God’s Banquet invitation. I’ve been invited to a bunch of banquets lately, and interestingly enough they are all great, and they are all on the same weekend, April 21-23. It is unique that they all ended up at around the same time, but it is not unique to get invited to banquets. Have you noticed that there are lots of banquets these days. Maybe you have been invited to them too. The ones I’m invited to tend to be fundraising banquets. The organizers bring in a special speaker, or a music group, have a silent auction, live auction, etc., and they give you an update about their charity or ministry, then raise money. The cool thing is that not only do you get a really good meal, but you hear about so many good causes, and you get a chance to support them! I love a good banquet, but I can’t say yes to them all. Frankly, I’m just too busy. Because I can’t go to this group of banquets coming up, let me invite you to consider them! First there is the Wenger Foundation Praise Dinner, on April 21, a banquet that raises money for a number of local charities, including Evangelical Seminary, of which I am an alumnus. The cost of this banquet is $125. This banquet supports great causes, and Evangelical has amazing educational programs for all kinds of people, but at $125 a plate, I’m not going to be able to swing it. The invite says the cost of the banquet is entirely underwritten, so all of the $125 goes to the charities. That’s great, but we’re busy that night…believe it or not, because we’re going to another banquet! To hear about that other banquet, I invite you to join us for Easter worship on Sunday at Faith Church. The very next night, April 22, Michelle and I have been invited to the Center for Parent/Youth Understanding annual celebration banquet at Shady Maple. Michelle and I have gone to that one numerous times, and some of you have joined us. It is always really great. Not only do you get a wonderful Shady Maple meal, it is free! Again, the banquet costs are completely underwritten so how does CPYU raise money that night? They have tons of silent auction items, and a live auction, and it is fun! Like the praise dinner, I’m busy and can’t make the CPYU banquet. If you want to go, you’ll hear an awesome presentation about CPYU’s important ministry to teenagers, parents and youth workers. Believe it or not, that very same weekend Michelle and I had also signed up to go to the International Justice Mission’s prayer gathering in DC. It’s not really a banquet, and we’ve heard it is an awesome prayer-filled weekend. IJM is also doing incredible work rescuing women from trafficking around the world. We were excited to go, so we paid the registration and booked our hotel. But after giving it some further thought, we backed out. With the kids in sports, work, the general busyness of life, and preparations for our big trip to Cambodia in June, we decided it would be best to stay home. So many great opportunities. But life is just too busy to go to every banquet. On Easter at Faith Church you’re going to hear about another banquet invitation. Shouldn’t Easter focus on the resurrection? Yes! We’ll talk about that too. But you’re also going to hear about some people who, like me, are too busy to go to a banquet. But this is a banquet invitation like no other. It’s not a fundraiser. It’s one you won’t want to miss. Will you be too busy? At the turn of the new year, we skipped a section of our study through Luke, and I promised we would return to it on Easter. So on Easter we jump back to a very interesting story of a banquet invitation in Luke 14:15-24. Hope you can join us. If someone offered you a free trip to the Olympics, including lodging, meals and tickets to a week’s worth of Olympic events, would you take it? This coming summer the Olympics will take place in Rio, Brazil, and I suspect many of you would jump at the chance! While I’ve never been there, I’ve heard loads of stories about the beauty of Rio. Twenty years ago, my wife had the opportunity to go to the 1996 Atlanta Olympics. Atlanta is not as exotic as Rio, but nonetheless, it was an all-expense-paid trip. The only catch was that she would be helping her sister who was a nanny for a family headed to the Games. The family wanted live-in childcare so they could see the Games, and they said my sister-in-law could invite a friend. She invited my wife. But my wife didn’t go. It was a missed opportunity. And I am to blame. We were newlyweds, I reasoned, and I couldn’t bear the thought of her being gone for a week just a month after we got married. So Michelle stayed home. I knew it was disappointing to her, but she never complained. As I look back on that, I wish I would have been more open to the idea. I wish it wasn’t a missed opportunity for her. I was insecure, frankly, and while it is very good for newlyweds to spend a lot of time together, I feel bad that she missed out on going to the Olympics. Then it seemed unfathomable to me that she would go on a trip so soon after our wedding. Now it seems like I had the wrong perspective. It is interesting how time can help us see a situation so differently. In the summer of 1996, I thought I was right. Now as we near our 20th anniversary, I see things from a new viewpoint. As a result of my old way of thinking, my wife missed out on something big. Have you missed out on something? This week as we celebrate one of the most joyous days of the Christian year, Palm Sunday, we’re going to meet some people who missed out on something big. The scene in Luke 19:28-48 is one of boisterous joy. Jesus has finally made his way to the capital city of Jerusalem. The crowds cry out with praise for him, declaring him the king entering his royal city. We call this his Triumphal Entry. The scene has all the makings of a glorious ascension to the throne. Except a couple things are really out of place. There are some oddities. First, the king, Jesus, is riding a donkey. Not too majestic, is it? And second, the religious leaders, rather than praising the king like everyone else, are confronting him, telling him to get his followers to pipe down. Third, the king is weeping. Those are not happy tears either. He is distraught on what could be his coronation day. Did the crowds notice? Did they find it odd? A king riding a donkey, facing jeers, and crying. What gives? What gives was a missed opportunity. Join us at Faith Church on Sunday to discover what Jesus was so upset about, what the missed opportunity was, and perhaps this story may help you avoid missing out too. Whew. Do you feel the intense emotion of that situation? It seems this guy genuinely wants to follow Jesus, or at least is truly interested in the idea. But when faced with the choice, he goes away sad. His sadness tells me that he hoped he could follow Jesus. Maybe he saw something intriguing in Jesus. But when asked to break free from the hold his wealth had on him, and actually give himself to the better way of Jesus, the man could not or would not break free. So I encourage you to allow Jesus to ask you what he said to the rich man: What is the one thing you lack? What is holding you back from following Jesus? It could be something holding you back from starting to follow Jesus for the first time. It could something holding you back from following him in a more significant way. It might not be riches. What is holding you back? TV time? Your cell phone? Really, it can be anything. Ministry. Career. Hobby. Sports team. Something very intangible. Having a clean house. What are you so preoccupied with that is keeping you from following Jesus? Social Media. Some of us put a lot of time into social media. Are children an idol? Over programmed kids can lead to you and your family missing out on participation in your church community. Or there is Helicopter parenting. Kids used to be allowed to run around town all day, just needing to be home for dinner. But now…not even close. Now many parents live through their kids. What about housing? Keeping up with the Joneses. Getting a new car. Are you a slave to appearances? Is this getting in the way of you following Jesus? Do you realize that if Christians in American tithed, gave 10%, we would have more than enough to provide clean water for every person on the planet. But we don’t give 10% because we can’t give 10% because that money is already accounted for in our bills, mortgages, car payments, vacations, and subscriptions and hobbies. And we say that we are just barely making it. What is standing in the way of you following Jesus more? Jesus’ disciple, Peter, makes a great statement in verse 28, realizing that the disciples had left all, they allowed nothing to stand in the way of Jesus. And Jesus explains further that we have to remove all blockades to following him. Riches and wealth, but also family! There is another person in this story who had to make a choice. In verses 35-39 we meet a really cool blind man who is persistent in trying to get close to Jesus. He knew who Jesus was. He knew he needed mercy. Twice says “have mercy on me”! He had a humble, teachable heart. Even after being told to be quiet, he gets louder! He knew Jesus was the answer to his dilemma and he got louder! Maybe you and I need to get louder in asking God to come near to us. Why would Jesus ask this? He already knew what the man needed. But Jesus asks him to be specific. There is something deeply faithful about praying a very specific request. When we pray too often we can be safe, vague. “Help the missionaries”. But when we pray specifically, we are putting it out there and saying that God and God alone has to come through in a specific way. It is scary to be so specific because what if what we are asking for doesn’t happen? If Jesus asked you this question “what do you want me to do for you?” what would you say? Notice in verses 42-43 where Jesus says the man’s faith healed him. Is Jesus saying that faith will heal anything we ask about? If we have enough faith, we can get what we want? No. Jesus is not making a blanket statement. Instead he is just describing what one man’s faith did in that situation. And so now seeing, he chose to follow Jesus, praising God. He’s getting loud about God again! Then others praise God. They catch on. Rich man calls Jesus “good teacher”. Blind man calls him “Son of David”. Rich man was blind to what was holding him back. Blind man could see what he needed. Rich man, after being asked to follow, does not follow Jesus. Blind man, after not being asked, does follow Jesus. Rich man goes away sad. Blind man goes away rejoicing. We all face a choice about following Jesus. Right now he may be asking you to give up something that is holding you back. What is it? What is holding you back? The blind man found that following Jesus was the best possible way to live. He had nothing to his name but the shirt on his back, and yet he was happy as could be following Jesus! Jesus changed his life. Will you choose to set aside what is holding you back? Will you choose to step out and follow him? I would love to hear what is holding you back! Will you talk about it? The blind beggar chose well! When we let go of the things that hold us back, we’ll realize that the way of Jesus, the life of Jesus, is so much better than anything this world has to offer! Have you had to make any major choices lately in your life? It could be a major purchase like a car or a house. It could relate to moving. Could be a job change. It could be about how to handle a relationship, about getting closer to someone or maybe about putting some distance between you and them. You may be faced with a choice related to finances. How will you report taxes? How will you use your income tax rebate? How will you spend, give, or save? How will you use your free time? Will you do a project at home, take a vacation, go on a mission trip, serve in a ministry, volunteer somewhere? There are so many difficult choices in life: How to respond to someone who has wronged you. How to respond to feeling marginalized at work. How to respond to death. How to respond to your own failures and mess-ups. Will you get defensive? Will you argue? Will you scrape and fight to preserve your point of view? Or will you be teachable, humble and try to see things from the other person’s point of view. This could be with a co-worker, a boss, with your spouse, with your siblings, with your parents, with your teachers, with your friends. Choices abound. Some people have said that life is just a series of choices. Choices can make life hard in a way. Have you ever felt that you’d like a break from all the choices? It’s not like we’re always dealing with whether we choose the Porsche or the Ferrari, the 2 million dollar mansion or the 3 million one, or even much less costly ones such as between an ice cream cone with 2 scoops or 3 scoops, or between the iPhone 7 or 7+. Those choices are all easy. Well, actually, if we were in a position to make those kinds of choices they would be easy because they have very little ramifications on life. That is, if you have the money to afford them! Choices can make life feel stressful, however, because we so often don’t know what is right in a given situation. Or we face a situation where both choices are tough, and we’d rather not have to choose at all. I know my argument has exceptions. Yes, if you are smart enough or rich enough, you could make or purchase a jet pack. But the larger point still holds, we have limitations, we are not free to choose to do or be whatever we want. Only God is that free. Though we have limitations, we are still free in a significant ways. Perhaps the most significant thing we can choose is that we can choose to follow the way of Jesus, or we can choose not to follow his way. 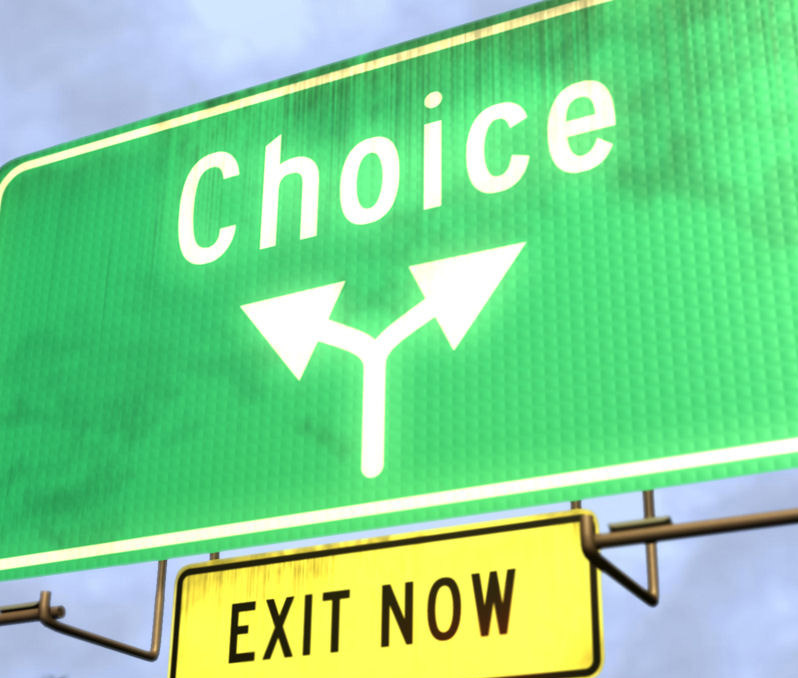 We can choose to follow it a lot or a little, and there are ramifications to the choice we make. Many of us have a desire to choose to follow Jesus, but we wonder if we are following him less than what we should be or could be. Less than what he wants us too. But we admit that there are things in life that are holding us back. There are barriers in our lives to following Jesus. Is there something holding you back? This Sunday at Faith Church we will meet two people that Jesus encountered as he was walking along the road. Each of these two people are faced with a choice. Each of them will have the opportunity to follow the way of Jesus. It is amazing how differently they choose. Through them, we’ll see what barriers might be holding us back. Check it out at Luke 18:18-43, and be our guest at Faith Church on Sunday!